Have you worked with an outstanding experiential education student at your business/school this past year? 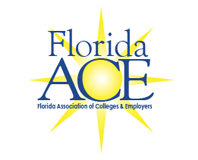 Nominate him or her for the Florida Association of Colleges & Employers Student of the Year Award! The award is presented to the nominating FloridaACE member or a representative of the member school on the student's behalf at the annual conference each June. Recipients receive a crystal award and a check for $300. To nominate an outstanding experiential education student for the Florida Association of Colleges & Employers Student of the Year Award, please fill out the required application form, submit required materials and send to [email protected].